Not practicing on Monday due to injury were wide receiver Travis Rudolph (quad), tight end Ryan O’Malley (ankle), defensive end R.J. McIntosh (unknown – Active/Non-Football Illness list), linebacker Connor Barwin (“soreness”), linebacker Thurston Armbrister (hamstring), cornerback Donte Deayon (hamstring), and safety Darian Thompson (hamstring). 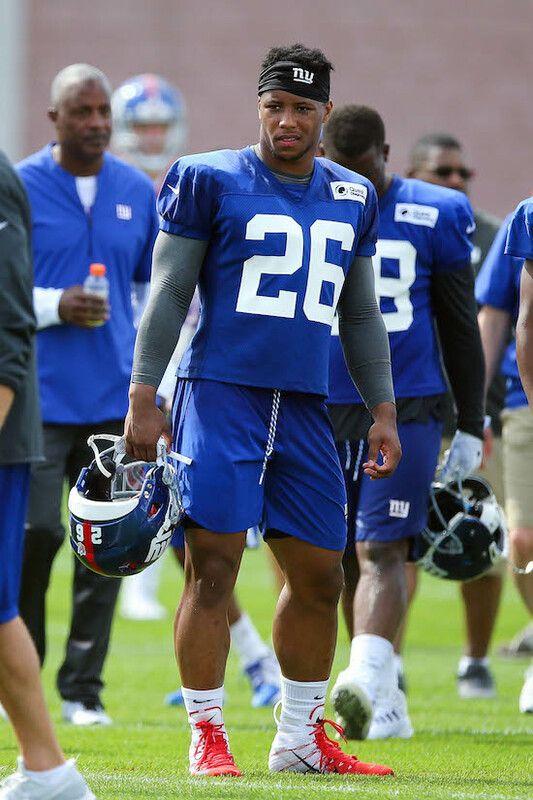 Running back Saquon Barkley strained his left hamstring late in practice after stretching out for a long reception. He left practice the field after that, having his leg wrapped. It was a light practice today as the team heads to Michigan to practice against the Detroit Lions. For the second straight practice, the Giants limited the number of snaps quarterback Eli Manning received. Quarterback Davis Webb received first-team snaps again today. He found wide receiver Odell Beckham, Jr. twice for touchdowns in red zone drills, including against cornerback Janoris Jenkins. Quarterback Davis Webb also overthrew three receivers and was involved in a fumbled snap. Quarterback Kyle Lauletta connected with wideout Kalif Raymond on a perfect deep pass between safety William Gay and cornerback B.W. Webb. Linebacker B.J. Goodson and left guard Will Hernandez grabbed each other’s face masks and nearly came to blows. Safety Michael Thomas picked off quarterback Kyle Lauletta. Curtis Riley was the first-team free safety and William Gay the first-team slot corner for the second practice in a row. Running back Saquon Barkley badly beat linebacker Alec Ogletree on a wheel route and out-ran cornerback Janoris Jenkins to the end zone on a pass from quarterback Kyle Lauletta. (This was the play where Barkley injured himself). Quarterback Alex Tanney connected with wide receiver Jawill Davis on a deep pass. The Giants will practice against the Detroit Lions in Michigan on Tuesday, Wednesday, and Thursday (open to public).